This is a simple project, but I think the results are so pretty. These make a nice gift or decoration for your house. No special candle-making tools are necessary. 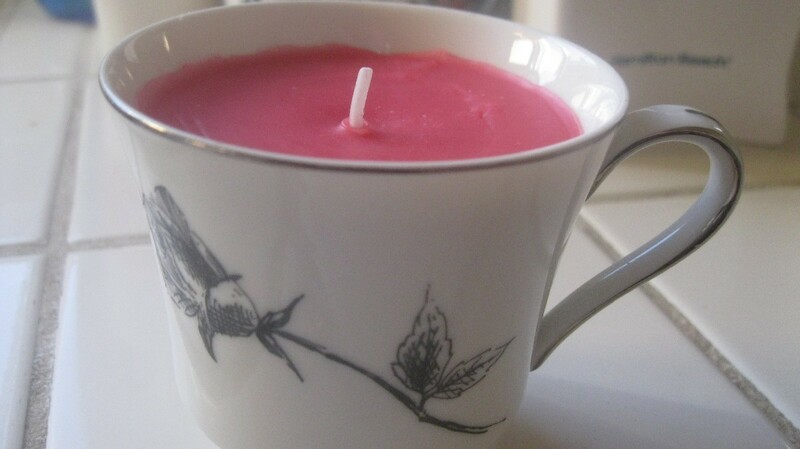 You can purchase the candles at a dollar store and pour the wax into an old teacup or mug. I paid $5 total to make these 2 candles. 2 candles from the dollar store - These were the short, stubby ones. You can use any color or scent. I like the red. Something to melt the wax in. I have an old saucepan that I melt wax in. Or you could even use a clean metal can that has been placed in a pan with about 1 inch of simmering water. 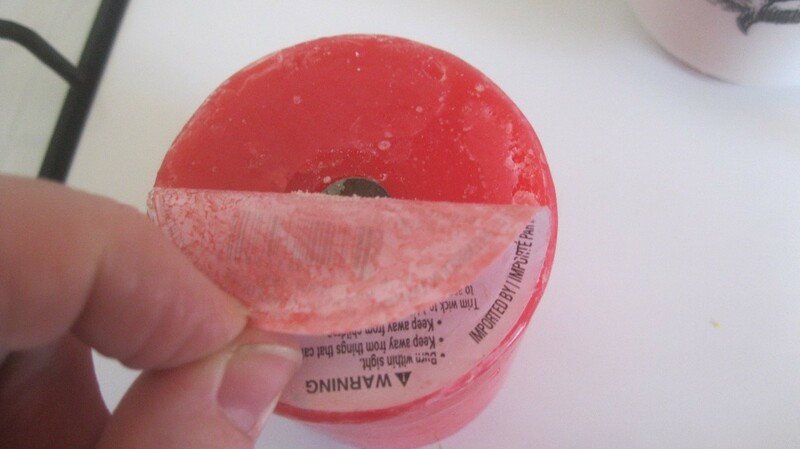 Start by taking the sticker off the bottom of the candle. 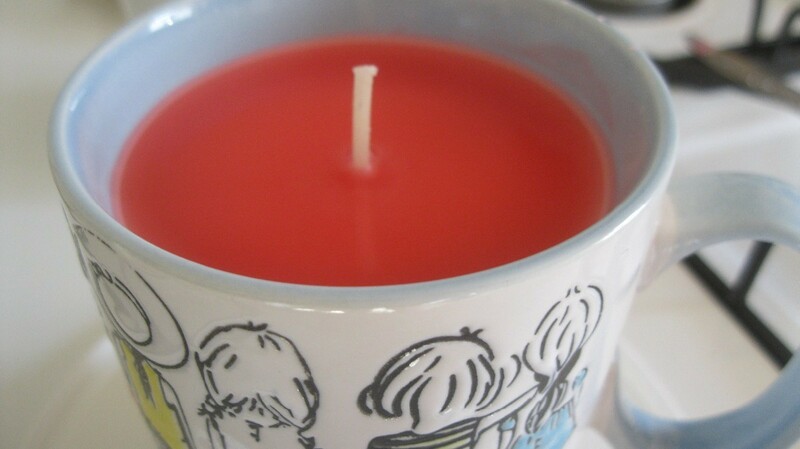 You will be melting this candle and you don't want to deal with that sticker in the wax. 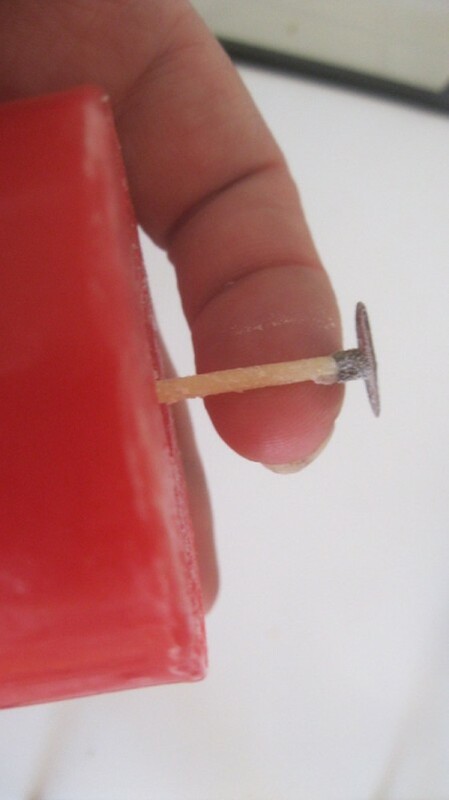 99% of the time, the wick pulls right out from the bottom. Take it out. If it doesn't come out, try the other candle. You can discard the wick or use it to make another candle. I made 2 candles, but I had bought 3 candles. 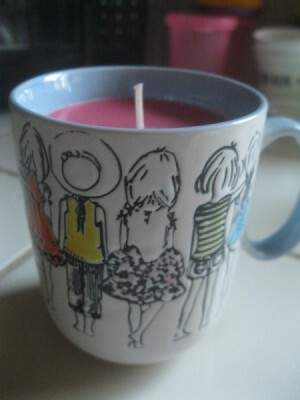 Put your other candle (with the wick in it), in your cup. If it is too large, you'll need to melt the sides a bit. Just rest it in your pan and rotate it to make sure it's even all around. 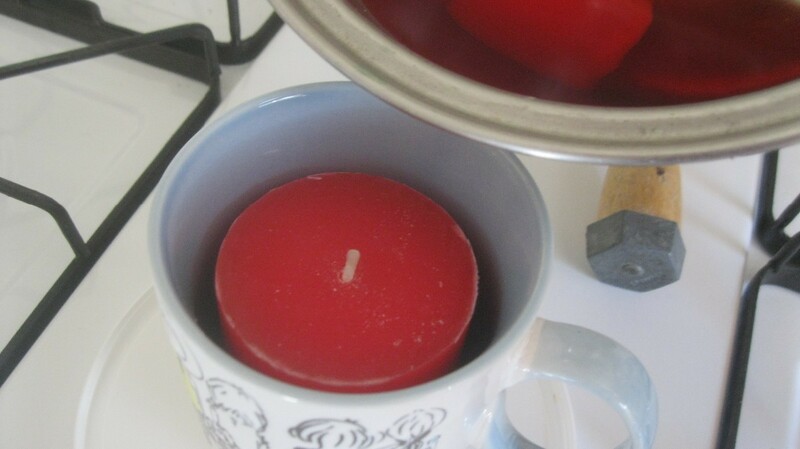 Melt your other candle (without the wick) on a very low heat. You don't want it too hot or there is a chance it could crack the cup. I've never had this happen, but I am guessing it could if the wax is too hot. Move the candle around. Don't burn yourself. Place your cup on a protected surface, such as wax paper or something that you don't mind wax on. Sometimes, the wax spills and it is a pain to scrape off. 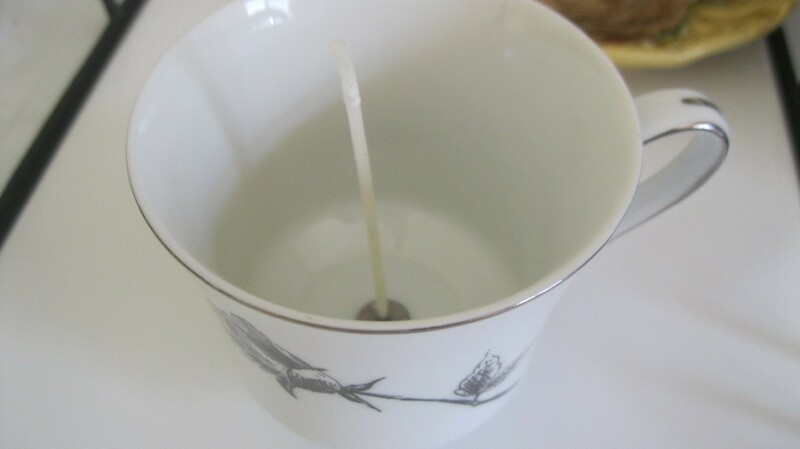 Gently pour the wax into the cup. Don't pour directly over the wick. But don't pour too close to the sides, either. 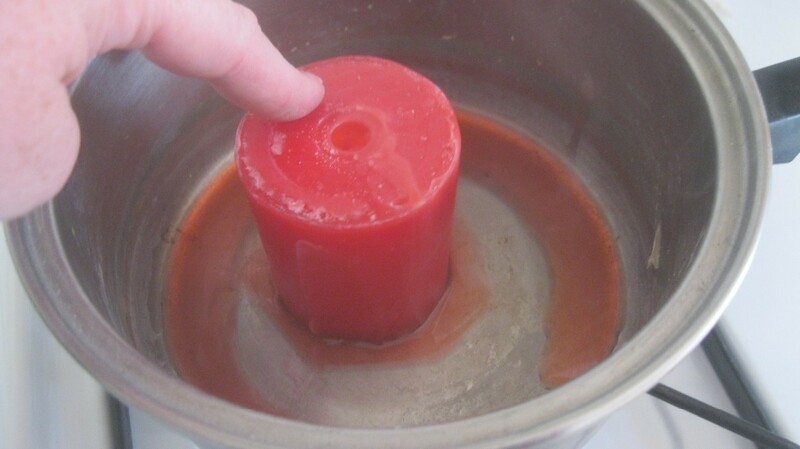 Pour until the wax reaches the top of your candle. Let candle harden. 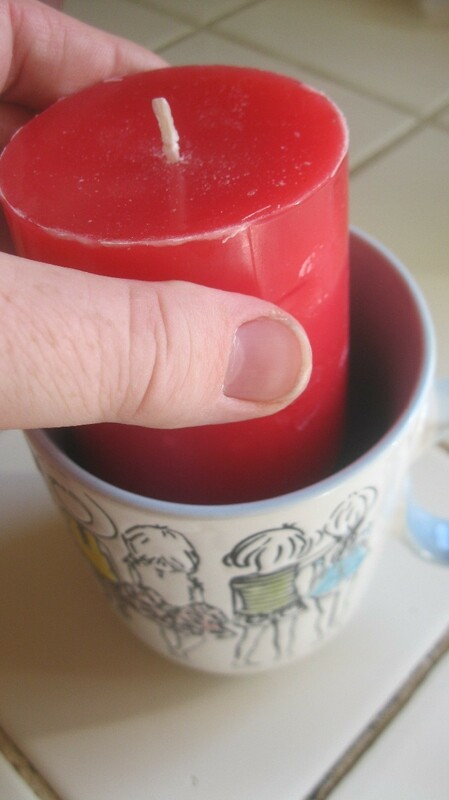 If you got some wax on the top part of the cup, gently scrape it off with a butter knife. I had leftover wax, so I made a second cup. 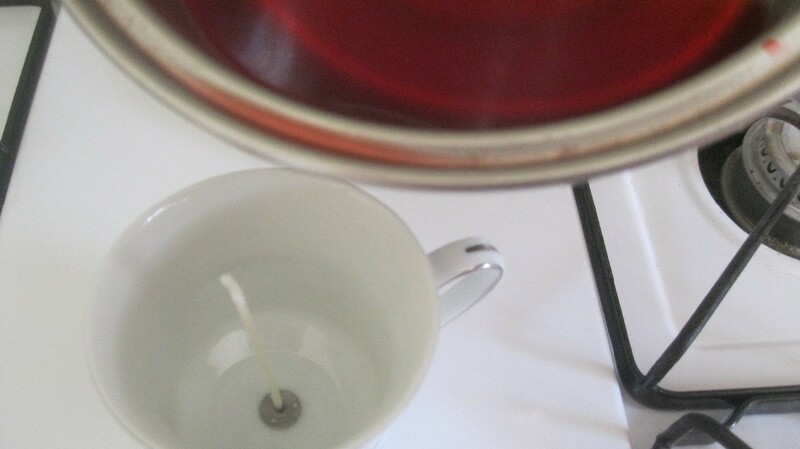 To do so, place the leftover wick in the teacup. 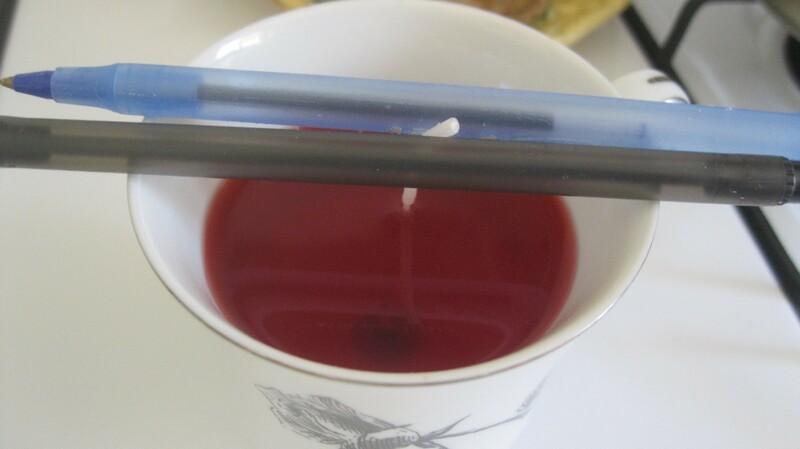 Place pencils or pens on either side of the wick to hold it in place once the wax has been poured in. You want it as centered as possible. Pour your wax in. If you don't have enough, open up another candle and melt that. Once the wax has been poured in, keep an eye on it as it hardens. Sometimes the wick will start to fall over. Just put it back in place and push the pencils back to their "holding" position. Keep for yourself or bag one up and give as a gift. I love this mug and I found it at the dollar store! Always remember to keep an eye on burning candles and don't leave them unattended. Be safe! Excellent tutorial! I am going to make some for myself!